To find an interesting future, one with different challenges each day, a chance of excitement and yet security, and the opportunity to love and be loved. 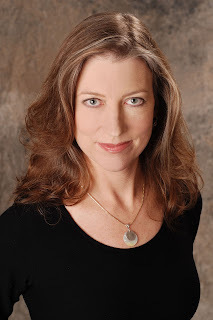 Meet amazing dreamer, historical author, Kate Dolan. Personally, I think Kate has super powers. This extraordinary woman has published nine novels and three novellas while being a full-time mom and working part-time. Having lived the life of a full-time mom for years― kids pulling at me in every direction at once―I don’t know how she was able to rub two words together. Thirteen books…that is incredibly impressive. What I find so inspiring about Kate's life is that she seeks out challenges. I see my daily challenges as a burden I have to overcome. She sees her challenges as a source of excitement, opportunity. Kate, after reading your interview, I have decided I need to adopt your definition of challenge. As for your― THE DREAM―it’s my primary dream as well. It’s should be everyone’s primary dream. I can’t thank you enough for being part of this series. Please take a moment and tell us a little about yourself. I have an eclectically suburban life. Married with two kids in high school, I’m fortunate enough to not work full time at a paying job at present so I can write fiction, blog about history, coach my daughter’s jump rope team, and earn a little money doing some part time administrative and bookkeeping work for another writer. Since I’m a history nut, I like to participate in living history events whenever I can. I write historical fiction that has too much romance to please pure history readers and not enough to satisfy true romance fans and is probably a little too goofy to fit in either category. I also write contemporary mysteries under the name K.D. Hays, but those, too, focus on relationships more than the "whodunit" aspect of a classic category mystery. But real life doesn't fit in a category, and I do think that focusing on the goofy, fun aspects of living make the journey a lot more enjoyable. When I started to write this, I realized that while I feel I had achieved many of my dreams, I couldn’t really articulate what they were. Oh, there were some easy ones – my dream of owning a new car was realized when we bought our minivan eleven years ago. I still think of it as my “new” car even though it has 160,000 miles on it and I’m afraid it will break down every time I pull onto the highway. The fulfillment of smaller dreams like this can be satisfying, but unfortunately more often, as soon as I get what I want, I forget how much I wanted it and just take it for granted. Maybe that’s why it is hard to figure out just what major dreams have come true in my life. Having a novel published was a dream but not THE dream. It’s part of a series of dreams – being able to finish the first draft of an entire novel, allowing someone other than my mom to read it, finding a publisher who deemed it worthy of publication – those were all part of the series. Later on came success in tiny increments which, while frustrating when watching the more direct path of others, does make me appreciate each step just a bit more. But even the dreams related to writing are not THE dream. I think for me THE dream was to find an interesting future, one with different challenges each day, a chance of excitement and yet security, and the opportunity to love and be loved. And I’m there. Sometimes I have to remind myself, though. Challenges are just that – they are challenging. They require thought and effort to solve. They keep me from growing bored, but at the cost of frustration, tension, anxiety and exhaustion. I am in a love/hate relationship with challenge, but I cannot truly live without it. And the fact that my challenges may be mundane does not make them easier to get through. On a given afternoon, my challenges may include (1) getting my son to a baseball game in county X at 5:00 when my daughter and I are coaching jump rope in county Y from 4:30-6:30 and we live in county Z (2) getting my heroine to stop seeing the hero as a bacon-brained nincompoop (3) translating the terms of a contract from legalese to something approaching English, and (4) trying to get the dogs to pose for a blog picture in front of a simulated place setting of a medieval banquet staged in my dining room. The challenges are different every day. Many of them aren’t terribly interesting, like trying to walk the dogs, empty the dishwasher and clean the rabbit cage before I have to leave to pick up one of the kids for an orthodontist appointment. But even if not particularly exciting, the challenges are different each day, and I know myself well enough now to see that I need variety in my day. When I worked at a traditional 9 to5 job the routine was pure torture. I went to law school thinking that when I got a "real" job, my days would be interesting. But the work was still the same, and the routine bored me beyond belief. In the eclectic life I live these days, there’s still work, and that means there’s still torture, but it’s interrupted by moments where I truly enjoy what I’m doing, whether it’s taking down the sarcastic exchange between characters in my head, listening to my son and his friends rib each other during the carpool home from cross country practice or helping a jumper do her first double under. I can escape to another life any time I sit down at the keyboard. It’s excitement with security because I can leave that world behind any time it becomes uncomfortable (or if I want a fresh cup of coffee or the clothes dryer goes off). If I was an underworld spy living a real life of excitement, I wouldn’t have an “escape” key. And excitement is all well and good, but at the end of the day, coffee motivates me more. Have I achieved critical acclaim? Not really. Have a million people read my books? Definitely not. Am I happy with the stories I’ve created? Sometimes, it depends on when you ask me. Have a made a lot of money? Definitely not (times ten to the infinite power). But I have challenges, I have family and friends to love (and use in my stories!) and I have variety. That dream is real. And I hope I can keep it that way! What's next? I guess that my next dream is just a continuation of the one I'm living now. My dream is to keep the variety of challenges in my life, and to be brave enough to take on new tasks even if there's a very good chance I'll humiliate myself in the process. One of these days I will need to start earning real money so part of the dream will be to find a way to derive more income without losing the variety and spontaneity that I crave. And the ability to get up and get coffee whenever I want--that's something I'll need to keep as well. This is Kate Dolan's new release, Change of Address, just in time for Christmas. Though he could see no flames coming from the house, smoke poured out the open front door and drifted up from the behind the building as well. The pungent aroma of burning rotten wood filled his lungs as he drew closer. “Mary?” he called out, hoping she was out in back of the house. He stopped for a moment, wondering whether to look around outside but decided to go inside before the fire grew any worse. His pace slowed as he realized there did not seem to be any fire upstairs. The first chamber he glanced in was empty of everything save a few trunks. And when he stepped inside the chamber next to it, he found more trunks and a young lady of uncommon beauty standing next to them with her back against the non-flaming wall, eying him warily. “I was looking for Mary Puckett, the girl who lives here,” he said stupidly. Obviously this striking blonde incomparable was not Mary or even vaguely related to her. The young lady’s speech, manners and dress plainly revealed gentle breeding. But why was she here? The Pucketts had lived in this old house as long as he could remember. But now that he thought about it, Isabel had mentioned something about new tenants somewhere. If he’d realized who the new tenants would be, he would have paid more attention. “I’m sorry, I…” He really could not think of how to apologize properly for his shocking intrusion. When she nodded for him to leave, he immediately bowed and stepped out of the room, but despite his wish not to frighten or offend the young lady any further, he could not resist the urge to peek into the last bedchamber. “She said to be on your way!” From behind the door came a screaming banshee wielding a handful of sticks which she used to swat him on the side of his head. The banshee couldn’t have been much more than Mary’s age but she had obviously enjoyed a healthier diet over the course of her life because she was as stout and strong as a ploughman. “Ouch! There are thorns in—” His words were cut off by another swat from the banshee’s bundle of branches. “Out, vile intruder!” the girl demanded in an imperious squeak. “You have no right to invade our home.” She raised her weapon to strike again but this time he was ready and was able to intercept the blow, grab the bundle of sticks and twist them out of her hands. He turned to see the young lady he’d seen initially, an older and more refined version of the blonde banshee who’d hit him, glowering at him with an expression as dark as her face was fair. It was without a doubt the single most unapologetic apology he’d ever received. “Are we to expect visits such as this on a regular basis?” She eyed the bundle of sticks as if she wished to seize it for her own use. 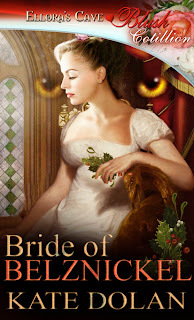 Bride of Belznickel is Kate's first and only ghost story. 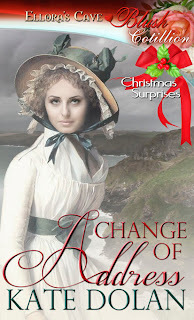 Hannah Brown is forced to spend the Christmas holidays far from home with cousins who ridicule her at every opportunity. To get revenge, she tries to scare them by making up stories about the Belznickel, the Christmas demon. Kate and I would love to hear from you. To leave a comment, click on the tiny word, comment, at the end of the post. Sorry it’s so hard to see. Thanks so much for including me in this series, Nancy. It's so inspiring to read the stories of how different people have perservered to follow their dreams despite the obstacles in their path. This was a great post!!! I too love Kate's take on life and challenges. So refreshing :) I love your witty banter between characters and the sarcasm makes me smile. Your new books look awesome! Now...you've also made me want some coffee, so off to make a cup! Happy to see you here. Kate's take on life is not only refreshing, but made me revise my thinking on a few things. Who knew challenges were a good thing. Thanks for dropping bye. Hugs! I have to agree with Eliza. What a wonderful outlook on life you have, Kate. So many people see the half empty glass and bemoan what they are missing. I love that you see everything as a challenge, no matter how small. I loved your post. Good luck with the new book too. It sounds great. Oh I definitely have times where I see the glass as not only half empty but also just about to be spilled. It's only when I pause and reflect on how fortunate that I am that I notice the rest of the milk hasn't spilled yet. What I'd give for several days of yours or Nancy Week's optimism!!! Geez - you two are my heroes. You should know, Ms. Dolan, that your words are encouraging and funny, and its those two elements - encouragement and humor - that make my day when I realize that I've forgotten to dream. I look forward to reading your novels soon.